All information in this post is courtesy of R. Ryanne Probst, Associate Publicist|Berkley Publishing Group, Penguin Random House and Amazon. A smart, big-hearted story about a family torn apart and the young boy on a mission to unite them all. Fact: It is up to me to reunite them—because who else is going to do it? Beloved U.K. author Katy Regan’s U.S. debut LITTLE BIG LOVE (Berkley Hardcover; June 12, 2018) is a make-you- laugh, make-you-cry story that’s perfect for fans of the TV show Parenthood and Nick Hornby’s About a Boy. Set in a small fishing town in northern England, Regan’s novel is told through the alternating perspectives of ten-year-old Zac, his mother Juliet, and grandfather Mick as it captures the story of one sweet and wise-beyond-his-years little boy and his pursuit of the perfect family. Regan, a former journalist and editor at Marie Claire magazine, makes the family drama feel real and the characters on the page come alive. Informed by her own experiences as a single mother raising a young son, Regan convincingly portrays the highs and the lows of parenthood and brilliantly captures the voice of each character: from self-deprecating modern mom Juliet; to working class man’s man Mick; to fact collecting, cooking-obsessed, tender-hearted Zac. As their chapters unfold so too does a deep-buried family secret that Mick has held onto, the reason Zac’s father disappeared, and a tragedy at the center of the family’s decade long disconnect. Katy Regan was brought up in a seaside town in Northern England. 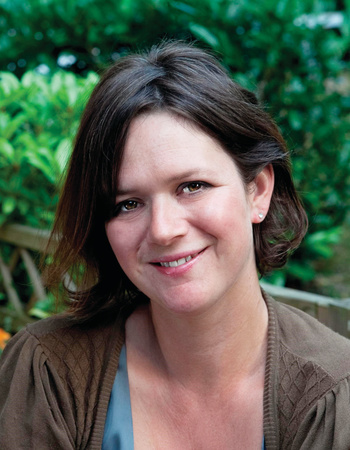 She studied at the University of Leeds before moving to London, where she worked as a journalist and as a commissioning editor at Marie Claire magazine. Katy has written four books published in the UK, and Little Big Love is her US debut. The winner is Robyn from New Jersey. The author, Kate Regan, looks lovely, and the book sounds interesting. Thank you for hosting this giveaway! I will share it in my blog's sidebar.